Unfortunately, the PSU you just bought isn’t adequate for your Eurorack system? It’s common to be confused by the “-V” label. Yes, “-V” on a PSU is a “negative” output, but only compared to the positive output. Your synth needs more! So, what is the difference between “-V” and “ground”? How to select and use a proper power supply for your Synth? In Eurorack systems, as in many Modular Synth system, the PSU needs to deliver 3 outputs: One positive, one negative and one between the positive and the negative ouputs. That output is called Ground (GND for short). It’s the reference voltage of your system. Consider it as your “0 volt” level. And it’s not the same as Earth tab on your PSU. Even if most of the time, they are linked together, they are different. But that’s an other subject. In Eurorack systems, the GND rail is NOT the negative rail. It’s a common mistake. If you tie together GND and negative rail, you will create a HUGE short circuit! On a lot of PSU, “-V” and “+V” outputs are floating. 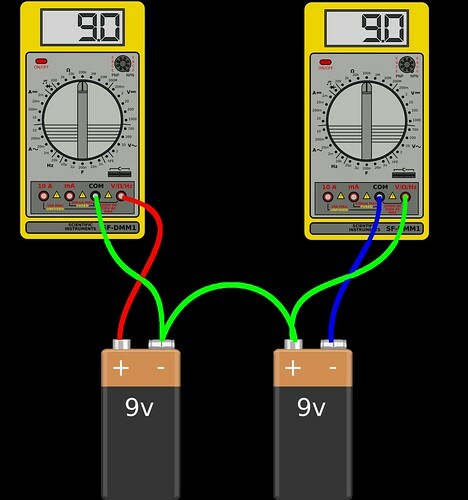 It means that the two outputs are acting like the two poles of a simple battery: if you try to measure the voltage between the two battery poles, you will read a value, but if you try to read the voltage between, for example, your chair and the positive tab on your battery, you will probably read “0V”. There is no common reference between your chair and your battery, until you touch the metallic parts of your chair with the second battery pole. It’s the same for your PSU. Until you connect one of the output poles to an arbitrary reference. Now, if you try to use the Earth pin as a ground reference, you won’t get a middle voltage point between the two DC outputs. You will just get a random voltage or a “0V” because your voltmeter is unable to read a floating value, just as it isn’t able to read a voltage between one pole of a battery and your chair. Each voltmeter reads 9V. But as the negative pole on the first battery is connected to the positive pole of the second battery, then we get here a “0V” point in green and a negative rail, here in blue. The blue wire is 9 volts below the “0V” point. It becomes “-9V”. And if you try to read the voltage between red and blue wires, you will get 18V. To be precise, 0V will become “ground” only if you connect it to the ground of your entire system. You understand now why you cannot link “ground” and “-V” together. You shortcut one side of the PSU if you do so. If you want to get the 3 necessary DC rails (positive, ground and negative) you need either a split (or dual, or symetrical) PSU, or 2 identical (floating outputs) PSU connected together in series, the central point being the reference point. Or simply two identical batteries, if your synth requires very low power. Some Meanwell PSU are able to deliver such split voltages. The Mini Dual Power Supply is also able to provide the 3 rails, but at a low power. You can also use an inverter. It’s a DC to DC converter. It creates a negative voltage from a positive voltage.